I've been thinking about water, particularly how the oceans of a planet affect the evolution of the people living on it, their choices for habitation, agriculture and infrastructure. Of course there are many other factors that influence these things but oceans seem like a good place to start, and with 71% of the Earth covered by them there is certainly plenty of reference material about. I had a couple of thoughts about how to procedurally generate the water masses for my planet, the most straightforward and probably most commonly used is to simply decide upon an elevation level to define as the sea level with everything generated by the noise functions under that counting as water. 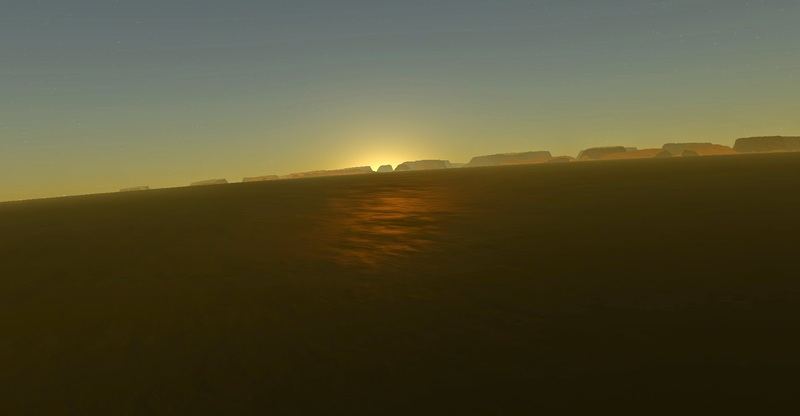 You can then render the water at that elevation and the GPU's Z buffer will sort out the intersection with the land. 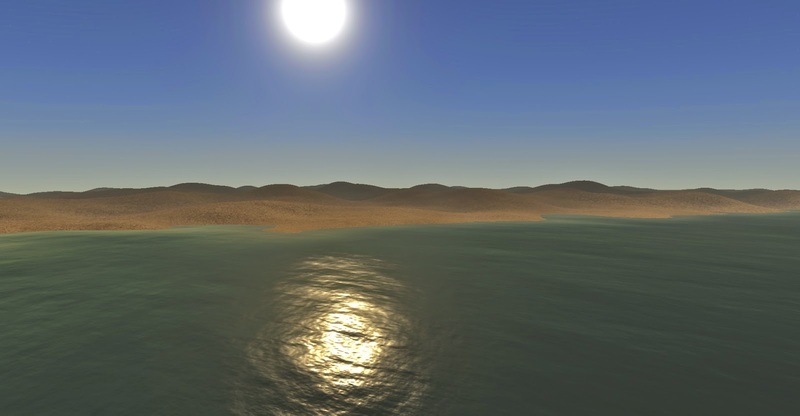 While I still want the simplicity and benefits of an established sea level, I wanted to have a look at making water region generation more integral to the overall planet's procedural system rather than it being treated essentially as a post process. Eventually it would be nice to have bodies of water at different elevations so mountain lakes, tarns and similar could be created preferably with rivers and streams connecting them to each other, waterfalls and larger bodies of water but that's all for the future. To make water body creation part of the terrain system the heightfield generation itself has to be aware of the presence of water so there needs to be a way to define where the water should go. My first attempt at this was using the country control net as I thought the country shapes would make pretty decent seas and by combining a couple of adjacent ones some reasonable oceans. By creating the countries as normal then simply flagging some of them as water such regions can be established, the heightfield generator can then ray-cast the point under consideration against the country net and if it finds it's within a water "country" use a noise function appropriate for sea beds that will return low altitude points below the global sea level. When I tried this however a couple of points became apparent, firstly having to ray cast against the country net's triangulation slows down the heightfield generator which is significant when it has to be run so frequently to generate the terrain and while optimisation might mitigate some of this cost I felt a more significant problem was the regularity of the water zones created. With each being formed from a single country there were for example no islands generated which is quite a big drawback and for me pretty much discounted this approach. Instead of the country net then how about using the terrain net instead? 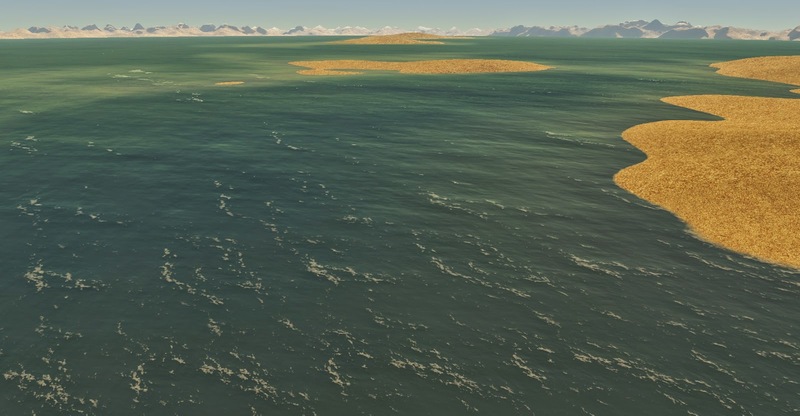 By adding a terrain type of Ocean that generates a plausible seabed heightfield that lies below sea level to the existing terrain types such as mountain, hilly and desert deep water regions could be formed using the same controllable system employed for those other type of terrain. The turbulence function described previously that perturbs the terrain type determination will also then affect the water region borders creating some interesting swirls and inlets. There are some drawbacks to using the terrain net instead of the country one however, there is nothing for example to prevent an entire country from ending up under water or possibly more problematically the vast majority of a country could be under water leaving an implausibly small section remaining that simply would not really exist in the real world. On balance however I thought this is the better of the two systems so am going with this for now. Rendering of realistic water is a long standing challenge for real time graphics and one that I've looked at myself from time to time in my various forays into terrain generation and rendering. For this project I thought a good place to start with generating the actual geometry for the water surface would be to use essentially the same system as I already use for the terrain, namely a subdivided icosahedron. 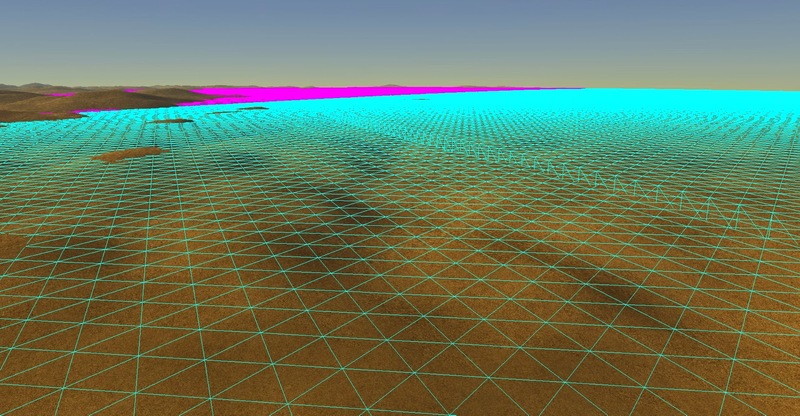 The existing triangular patch generator can easily be extended to determine whether any vertices in the patch are below sea level or not, and if so a second set of vertices for the ocean level surface patch is generated. These vertices represent the triangular area of the surface of a sea level radius sphere centred on the centre of the planet and encompassed by the patch in question. Although the plan is to have realistic waves on the water these will be generated by the vertex shader displacing the vertices so a smooth sphere is enough to start with. 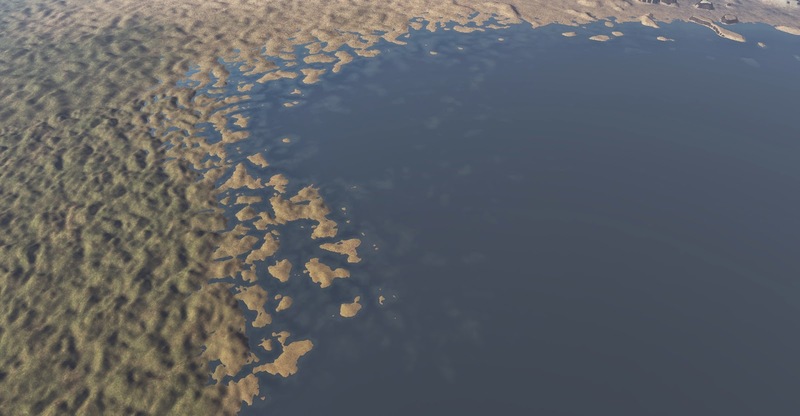 The level of detail system described previously can also be leveraged to decide which water geometry patches to render by simply running it in parallel on both the terrain patches and the water ones - a different distance scalar can also be used for the water patches enabling lower detail geometry to be used for the water potentially improving performance as long as the visual quality doesn't suffer too much. Even though the identical geometric topology allows the water patches to use the same index buffer as the terrain there is an additional and more significant optimisation opportunity here that would save significant memory. With each water patch representing what is essentially an identical shaped section of the sphere's surface at that level of detail they could actually all be drawn using a single vertex buffer with a suitable transformation matrix to put it at the correct position and with the correct orientation. Setting this up is a little fiddly so I'm leaving it for a future task but should memory become an issue it's likely to be one of the first things I'll revisit. As for the actual water visuals, the movement and appearance of water is notoriously difficult to simulate especially as the real thing behaves so radically differently in different situations - shallow water is totally different to deep for example and white water rapids completely at odds with languid meandering rivers. To make such a difficult problem manageable I chose to focus on just one aspect and when talking at planetary scales deep water seemed like the logical choice - the oceans created as described above will dominate any other water features I add in the future. 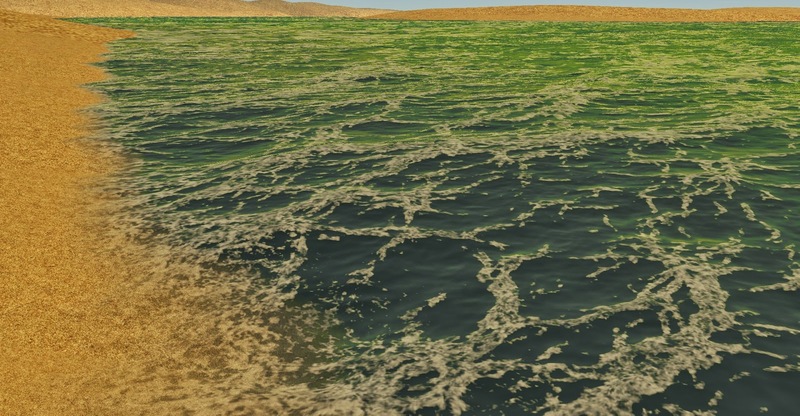 There are quite a few references and demos for deep water rendering but the one I chose was the NVIDIA "Ocean" demo from their now superceded graphics SDK which is in turn based on such classic work as Jerry Tenssendorf’s paper “Simulating Ocean Water”. I liked this demo as it is well documented and being GPU based heavily targeted at real time graphics. This demo uses a couple of compute shaders to perform the necessary FFT followed by a couple of pixel shaders to produce two 2D texture maps, one storing the displacement for the vertices over the square patch of water and the other storing the 2D gradients from which surface normals can be calculated and a 'folding' value useful for identifying the wave crests. High LOD wireframe showing how the smooth sphere vertices have been displaced to create the waves. Note that normally a lower LOD version is used as the majority of the shading effect comes from the normals computed in the pixel shader rather than the wave shapes produced in the geometry. The displacement map is fed in to the water geometry's vertex shader to displace the vertices creating the waves while the gradient/folding texture is fed in to the pixel shader to allow per-pixel normals to be created for shading and wave crest effects to be added. Using these textures as the primary inputs, there are a number of shading effects taking place in the pixel shader here to give this final ocean effect. Although the NVIDIA demo produces a nice output I decided to largely ignore the final pixel shader as it's use of a pre-generated cube map for the sky colour along with a simulated sun stripe was a bit too hard coded for my needs. Instead I fiddled around some and came up with my own shading system. Firstly the gradient texture is used to compute a surface normal which is then used with the view vector to calculate the reflection vector (using the HLSL reflect function). I then create a ray from the surface point along that reflection vector and run it through the same atmospheric scattering code that is used for rendering the skybox, this gives me the colour of the sky reflected from that point and ensures that the prevailing sky conditions at that location at that time of day are represented. This is important to ensure effects such as sunsets for example are represented in the water but even at less dramatic times of the day gives the water somer nice variegated shades of blue. Capturing the sun's contribution in this unified manner is especially useful as it's size and colour varies so much based upon the time of day, trying to represent that as a purely specular term on water can be a challenge often ending up with a sun "stripe" that doesn't match the rendered sun - especially near the horizon. A higher "Choppyness" produces more agitated wave movement, sharper surface relief and considerably more foam. In addition to foam at the wave crests I also wanted foam in evidence where the water meets the land, to accomplish this a copy of the depth buffer is bound as a pixel shader input and the depth of the pixel being rendered compared against it. This produces a depth value representing the distance between the water surface and the terrain already rendered to that pixel. This depth delta is added not just to the foam amount to render but is also used to drive the alpha component letting the water fade out in the shallows where it meets the land. This can be seen in both the images above where the water meets the land. The benefit of using the screen space depth delta rather than a pre-computed depth value stored on the vertices is that it reacts dynamically to both the movement of the vertices driven by the water surface displacement map and to anything else that penetrates the water surface. The latter can't be seen just yet other than where the water geometry meets the terrain as I don't have any such features but in the future should I have ships, jetties or gas/oil rigs the alpha/foam effect will simply work around where they intersect the water helping them feel more grounded in-situ. 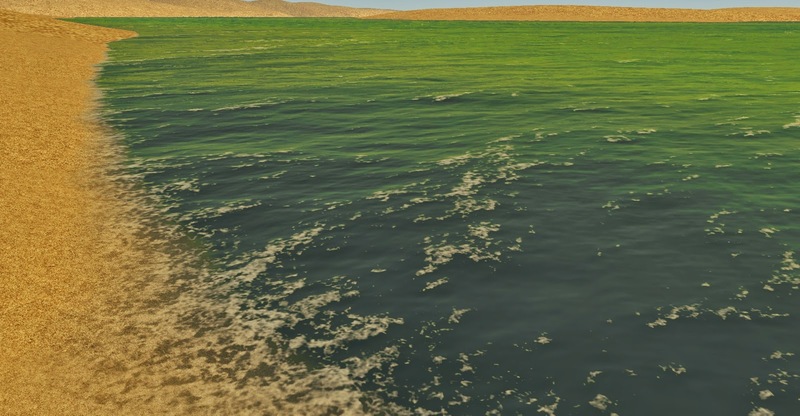 As mentioned above one of the fundamental problems with water rendering is that it behaves and appears so radically different depending on it's situation, but another problem with rendering water especially with planetary scale viewpoints is how it appears from different distances. The 512x512 surface simulation grid I'm using looks good close up but simply tiling it produces unsightly repeating patterns when viewed from larger distances. Not only does the limited simulation area become very apparent but the higher frequency of the surface normal variation produces very visible aliasing in both the reflection vector used to compute the water colour and the wave crest effect producing unsightly sparkling in the rendered image. Rather than simply increase the simulation area which would produce just a limited improvement and incur increased simulation cost instead I vary the frequency at which I sample the simulated surface with distance. The pixel shader uses the HLSL partial derivative instructions to determine an approximate simulation texture to screen pixel ratio then scales the texture co-ordinates to obtain an equally approximate 1:1 mapping. This effectively causes the simulation surface to cover increasingly large areas of the globe as the viewpoint moves further away. This is in no way physically accurate but produces a more pleasing visual effect than the aliasing, and by blending between adjacent scales a smooth transition can be achieved to hide what would otherwise be a very visible transition line between scales - an effect very similar to a mip line when trilinear or anisotropic filtering is not being used. Take a look at the second half of the video above to see how this looks in practice as the viewpoint moves from near the surface all the way out into space. Combining these helps make distant water a bit more appropriately indistinct. The final challenge with the water was taking the two dimensional result of the simulated water surface and applying it to my three dimensional planet. There are a variety of ways to map 2D squares to the surface of a sphere but each has major trade-offs involving distortion in some way or other. 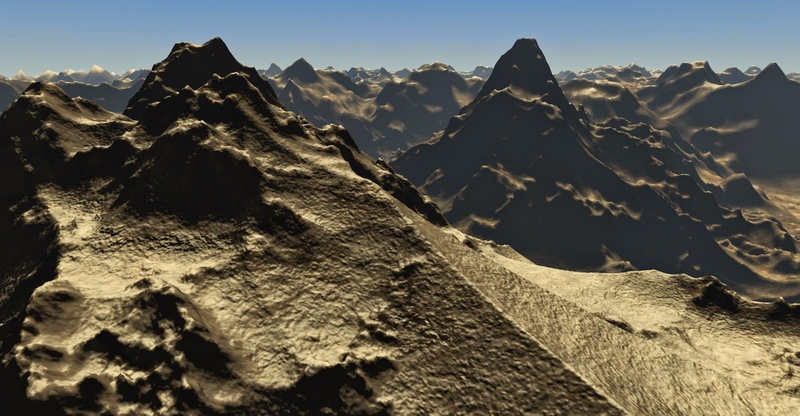 I decided to keep it simple and use the same triplanar projection system used for texturing the terrain - i.e. using the 3D world space position of the point being shaded to sample the texture in the XZ, XY and ZY planes then using the surface normal to blend between them. The only trick here is to make sure the directions of the normals from the gradient map are consistent so they are oriented correctly for the plane they are being applied to, getting this wrong and the sun and sky will not reflect properly in the water. I'm pretty happy with the water effect now, it has some artifacts still but I feel I've spent enough time on it for now and the effect is good enough not to irritate me. Next I think is integrating it's placement more into the geographic terrain generator especially in the area of trying to make interesting coastlines along with processing it's impact on the countries themselves. The whole idea that you're creating an actual round world is mind blowingly awesome, and you're doing such an awesome job. So vegetation? Any plans to make a blog entry on it soon? Thanks Chris, glad you like it. 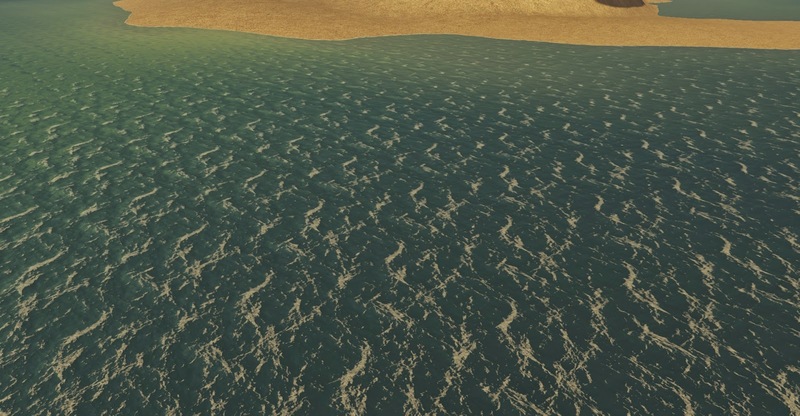 Regarding the wave travel direction in the water, you are absolutely right that the waves would be better rolling towards the shore - the problem is that the wind direction is baked in to the water surface grid simulation when it's set up and can't easily be varied at runtime. It's also a constant across the 512x512 sample grid so can't change depending on grid location. 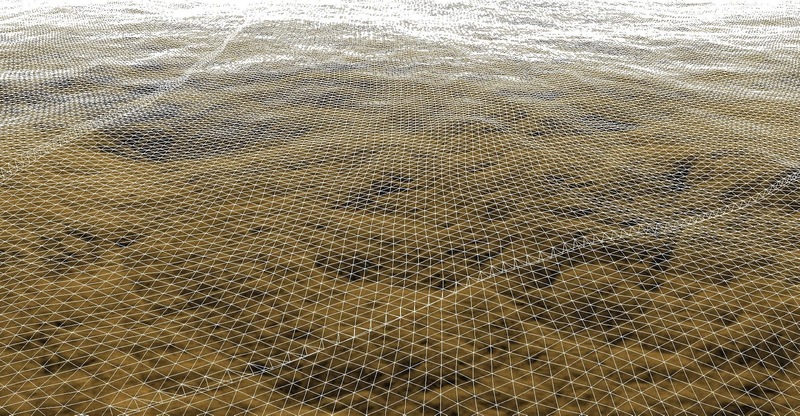 In order to have the waves moving sensibly towards the shore unique surface simulation grids would need to be set up for each section of shoreline which would be slow and likely prohibitively expensive in terms of memory and GPU performance. In short I absolutely agree it would look much better, but the amount of work required to even approximate the effect is pretty substantial! This is an interesting post, and got me thinking about how to improve the ocean water in my game engine. I'm taking a bit of a different approach with precomputed wave textures and normal maps for small scale waves, and sine waves using a tessellation shader for large scale waves. I think there are advantages to each of our approaches. I particularly like the way you did the ocean foam on the beach - I was never able to get mine to look the way I wanted.